CourseHorse has galloped into LA! Click on the site. Look up almost any subject and CourseHorse will connect you to a class. It’s a great way to lean into a dream. Say you want to switch careers. Maybe visions of creating masterpiece cakes keep appearing while analyzing data. Wouldn’t it be nice to throw on an apron over pajamas instead of a 3-piece suit? Still, you suspect stenciling on fondant should be mastered before ditching the secure 401k. CourseHorse to the rescue. 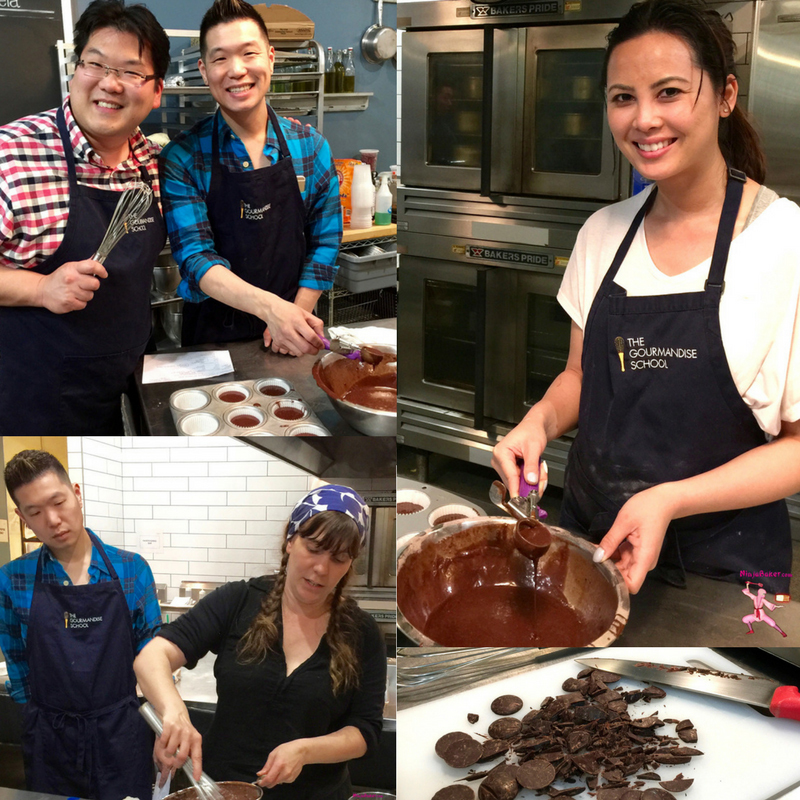 CourseHorse has over 2,000 cooking classes in Los Angeles. Whether it’s better baking skills or producing patisserie store beauties, CourseHorse is a great source. A search for baking on CourseHorse brought up Cakes & Cupcakes offered by the Santa Monica Gourmandise School. Curious, I signed up. Sooo glad I did. Clémence Gossett (a co-owner) and instructor extraordinaire presented the science (!) behind baking in terms I could understand. She also gifted the students with recipes for heavenly carrot cake and devil’s food cupcakes. 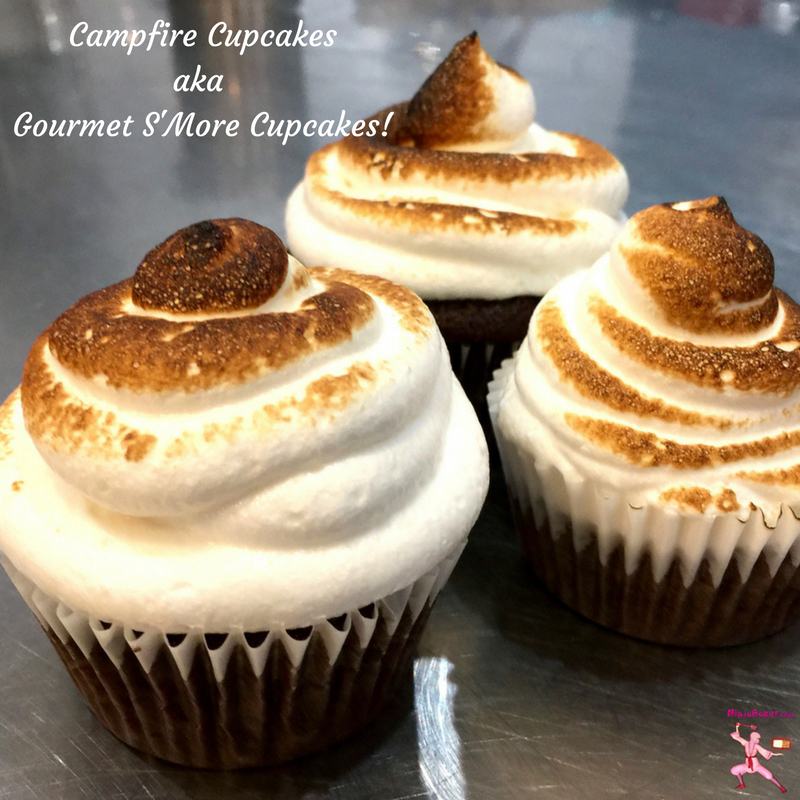 Clémence also introduced us to campfire cupcakes. (Think s’more cupcakes.) Thanks to Clémence, I’ve let go of my trepidation around butane torches. 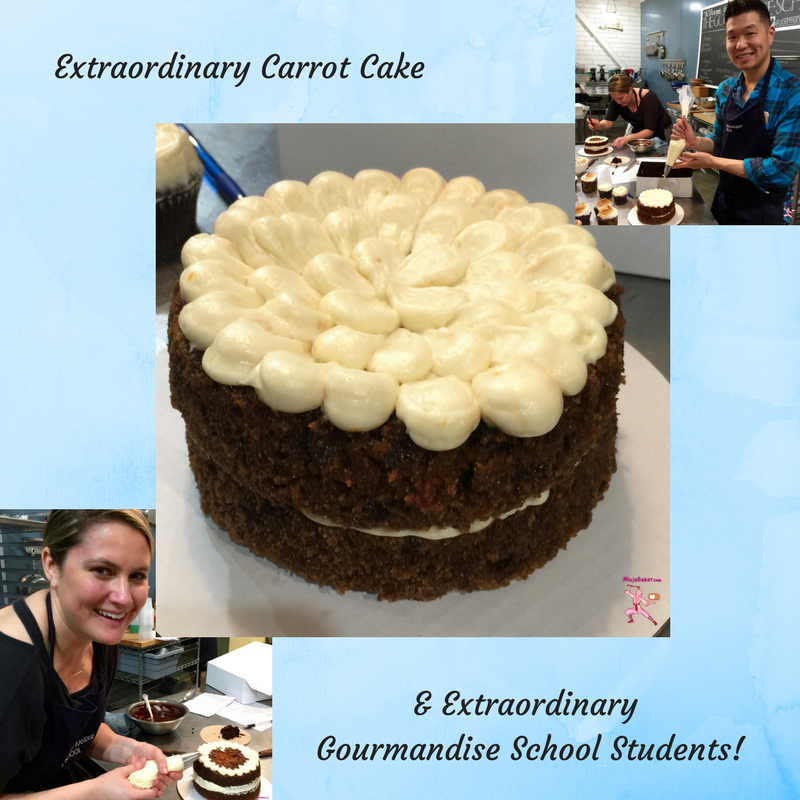 A few (of many) Cakes & Cupcakes tips from the Gourmandise School in Santa Monica. Use light colored pans for cakes and cupcakes. The darker ones make the cakes brown too quickly on the edges and bottoms before the insides are properly baked. AND place the light colored muffin cupcakes on a light colored cookie sheet. Why? The cookie sheet will even out the amount of heat baking the cupcakes. Skip the vanilla in chocolate cupcakes (and cakes.) Vanilla mellows the flavor. So, if you love pure rich chocolate, forget the vanilla. Oil is better than butter! Especially for your carrot cupcakes and banana bread. Oil is 100% lipid fat and coats flour so the cake is moister. Butter is 80% fat and contains water. While the butter adds a fantastic flavor profile, if want moist cakes, reach for the oil. Full disclosure: In exchange for this post I was given a free lesson at the Gourmandise School in Santa Monica courtesy of the CourseHorse. All opinions are my own. Gourmandise School Campfire Cake is a gourmet approach to the classic American s'more. Rich chocolate is drizzled over a wholesome wheat cupcake. 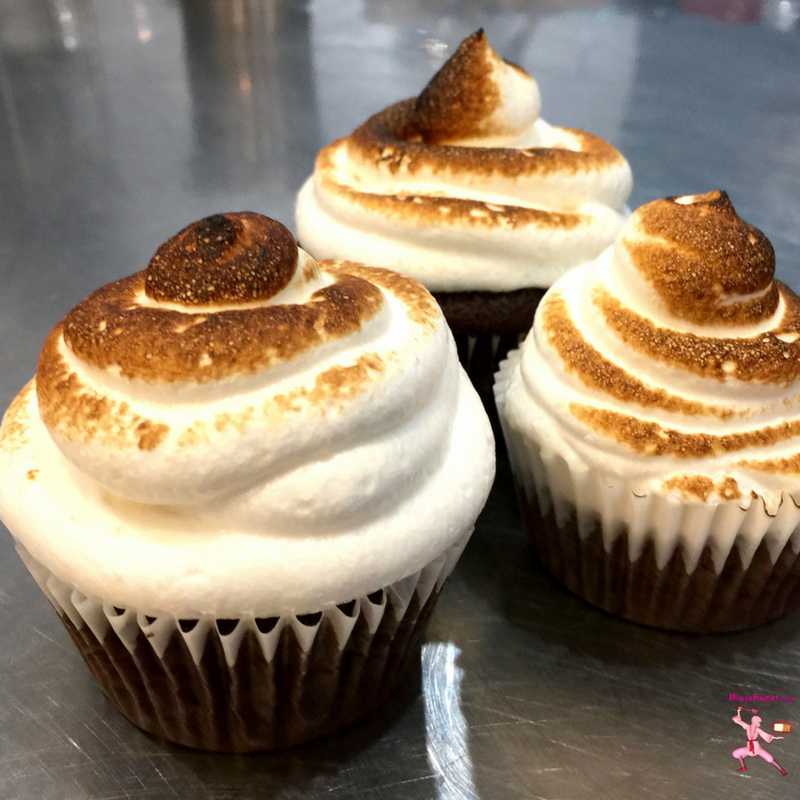 Mounds of Italian meringue frosting (or marshmallow topping) round off this cupcake designed for the dessert connoisseur! This recipe is also seen on The Gourmandise School - Santa Monica web site. Place parchment paper circles into two 8” cake pans or line muffin tins with cupcake cases. Whisk together the wet ingredients together in a large bowl. Sift the dry ingredients over the bowl and whisk until just combined. Pour the batter into the cake pans or divide into the cupcake cases. Bake for 30 to 40 minutes for the cakes and 20-30 minutes for the cupcakes. Touch the centers, if firm and springs back, it’s done. Chop up your chocolate finely. Pour over the chocolate and whisk. Drizzle over the cupcakes or cakes. Top with your favorite Italian meringue frosting or a dollop (or two!) of marshmallow fluff. Wishing you courses which gallop you in a hurry towards your dreams.